Artist’s Statement: Of all the visual wonders in both Real Life and Second Life, I have always found great beauty in stark and simple images; scenes that are not complicated yet have just enough detail to evoke a strong feeling. While I am looking at different scenes, I tend to gravitate to images that create feelings of loneliness and sadness, a certain quiet and pensive mood, and even to those that invite a bit of uneasiness. Edna St. Vincent Millay, a famous American poet well known for her sonnets, had created quite a reputation as an outspoken, unconventional, austere, and even grim writer. In my mind, her stark emotional words seemed a match for the simple beauty I found in Silent. Pairing phrases by ESVM with each photograph seemed to be unfair to direct the viewer toward a particular story or mood rather than letting them come to their own conclusion. But then again, as we don’t respond the same way to visual cues, we may not interject the same emotion into the written word. I understand the images will be a departure from the vividness, details, and color of Windlight but that is exactly my intention. A laying bare of beauty, if you will, devoid of the accoutrement offered to us by Photoshop and Windlight. The only tweaking was to cause the sky to be a shade of white in order to enhance the black and white quality in some of the photos. All photos were taken in the black and white sim called Silent. Any colored textures seen in the photos are what occur in the sim and are not post production additions. 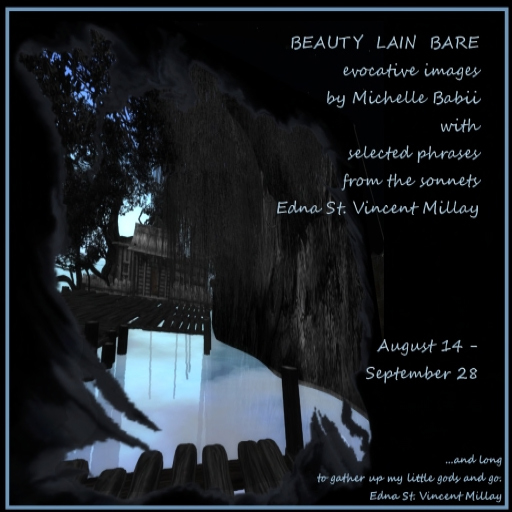 Michelle Babii is a well-known and accomplished SL photographer, who has specialized in unretouched SL images. She is also co-owner of the Manzanillo Artists’ Enclave. Charlot Dickins will be showing her bespoke sculptured prim sculptures in the Fashion Research Institute’s corporate headquarters in Shengri La Peace. This show will run from June 20 – July 27. 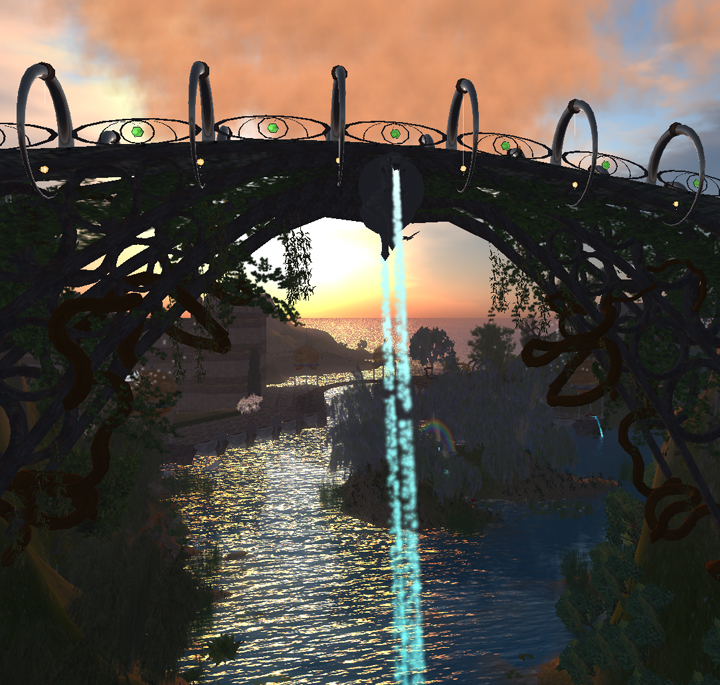 Artist’s Opening is 5-7 pm SLT, June 20. Please come meet the artist and see this beautiful new show! Artist Statement below. Charlot Dickins is the virtual alter ego of a really unkown real female person, who was fascinated with 3D for ages, but never could afford a decent software programme to try it out, nor did she see the use of making 3D builds -never to be watched by another eye of another living soul other than the ones she would be able to force- which would be, moreover, a great burden to her hard disk, that at the time had the size of one Mb. So for the sake of her bank account, a pleasant family life and a longer computer life, she left the 3D dreams where they belonged and forgot about them for a long, long time. At the sight of the Second Life building tool, the real woman behind Charlot Dickins went wild, the slumbering 3D urge awoke and a process of unchained, neverending and addictive prim twisting and turning had begun. Moreover, Charlot Dickins does not like short sentences and therefore only writes very long ones, and just like Madcow Cosmos she likes to speak about herself in the third person. This exhibition only shows sculptures Charlot Dickins made as a commission and gives you the opportunity to see them in one building, no need to wear out your prim shoes and go and look for them all over SL – if you might happen to detect that strange need deep in your inner self- and was an idea of, and made possible by, Callipygian Christensen, to whom she expresses her gratefulness. Thanks also go to Shenlei Flasheart of the Fashion Research Institute for providing the location. 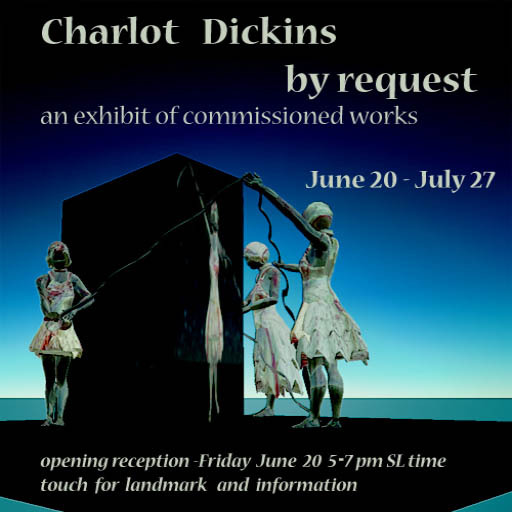 To keep a certain uniformity and prevent the public from thinking that Charlot Dickins is a very unstable minded, mentally disordered and inconsequent avatar, the sculptures that are shown here are made for only three commissioners: Alexandar Vargas, Intlibber Brautigan and Jade Vandyke, to whom she also expresses her gratefulness. Last but not least she would like to thank Carlbotd Truss, for giving her the opportunity to build as a very new born avatar and for supporting her building addiction. 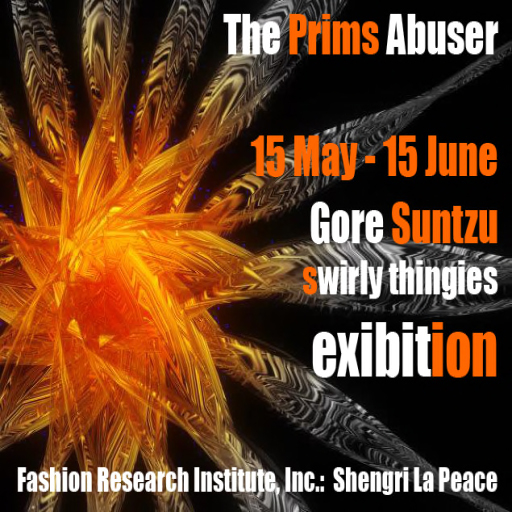 The Fashion Research Institute is pleased to host Gore SunTzu’s sculpture exhibit in our corporate office at Castle Queen Pea in Shengri La Peace. Please visit his opening, Thursday May 15, from 4-6 PM SLT. If you can’t make it then, his show will be up through June 15th. I do hope you’ll visit his show in Shengri La Peace. My abuses are unreal prims sculpture made with sculpties , and with some lil scripting to make them alive, the best word i can use for describe them is “pulsating”, they have a meaning? boh i dont know, but if the music is nice, the moon is full sometime can happen that they catch the mood of the ppl that are looking at them. I never considered myself the artistic kind of man, Secondlife helped me discover this side of myself. I don’t know if what i do can be considered art , for me is more an act of exploration looking for a a symmetrical dynamic movement, a metaverse heartbeat. It all start with a prim abused , that’s why i call them prims abuses (but don’t worry most of the times they don’t complain, to tell you the truth i believe they like it), than i look what happen. I believe this is a good example how powerful Second Life can be ( and i hope this will not change in the future). Without this place well i hardly imagine myself, in the quest of tryn to explain the meaning of my “art”. The object of art is to give (Second) life a shape. I still feel like my IBM OpenSim Spirit is slow, so I’m going to hold off burning everything to the ground and rebuilding till Team Leader Zha gets a chance to take a look at it. Everyone’s busy right now working on more project critical enterprise level matters, including me, so it’s not critical to me. Back in Shengri La SLtm, Calli almost has her gallery completed. I’m waiting till she’s done installing her pictures before I take a picture for posterity. Calli and I have been discussing the use of the small galleries that we added to Shengri La, and we’ve decided that she will curate the galleries. SL tm artists are encouraged to get in touch with Calli in-world if they are interested in exhibiting in the small galleries in Shengri La. They should drop her a notecard with their name, a paragraph about their work, and one or two representative images. We will host two concurrent artists in the galleries with their show openings and closings staggered. Please contact Callipygian Christensen in SLtm. We’re finally more-or-less finished with Shengri La, to the extent that I am ever finished with a build. 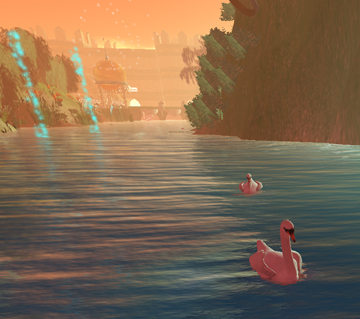 There’s a few tweakings I want to do – adding a few more underwater ruins, and the opensource horses so people can come and ride on the islands. But overall, I’m pretty content with the islands. I need to turn my attention next to the actual corporate offices, and finish off the community gateway. I hope to finish those off later this week, and with luck Spirit will be ready to do, too.